Passion vine grows with a passion, producing some of nature's most exquisite and complex flowers during warm months of the year. Classic butterfly attractors, passion vines make a wonderful addition to a butterfly garden, covering an arbor or a bordering fence. These fast-growing vines come in many flower colors and grow like there's no tomorrow. 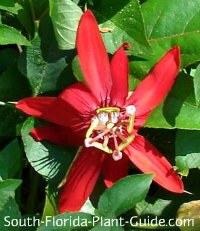 The most commonly grown is the red flowering variety (Passiflora coccinea). 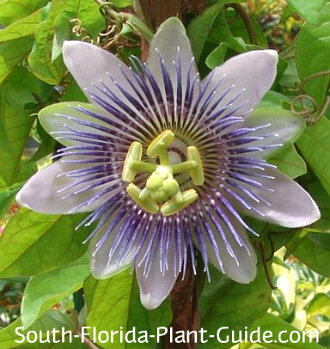 Others include the blue (Passiflora caerulea) and the purple Florida native vine (Passiflora incarnata) sometimes known as 'Maypop.'. These vines are ornamental rather than grown for their fruit. They do produce edible fruit but it's not especially tasty. Plan well for the rampant, vigorous growth of this vine. It requires support and plenty of room. One vine can run away from you - up trees, over the roof, into the neighbor's yard. Its upkeep involves regular trimming - though not so much that you never get flowers - and a hard pruning in spring. Good placement and room to grow are important so that you can enjoy the flowers and the butterflies they bring. 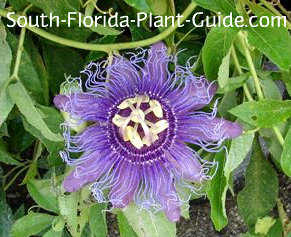 The best edible variety for South Florida is purple passion fruit vine (Passiflora edulis), which isn't usually available from your local nursery. 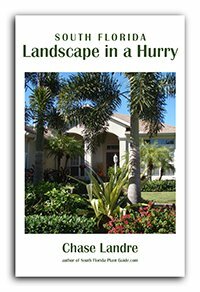 You may have to order it or look for it at rare plant sales. The cultivar 'Possum Purple' is said to be unbelievably delicious...plus it self-pollinates and has gorgeous flowers. These vines love full to part sun and flower best there. Bloom time is summer through fall. The red variety needs the warm temperatures of Zone 10 to thrive. The blue is more cold hardy and can grow anywhere in South Florida...if it dies back in winter it will usually pop right back in spring. Place plants 4 or 5 feet apart to grow along a fence. Keep a passion vine at least 6 feet (more if possible) from nearby shrubs or trees. Add a combination of top soil (or organic peat humus) and cow manure t the hole when you plant. Cut this vine back hard in spring - mid to late March - to keep it in bounds. Fertilize once or twice a year with a good quality granular fertilizer. Additionally you can use bone meal to promote heavier flowering.